With PowerGREP, you can quickly search for a piece of information through files and folders on your computer, including Microsoft Excel spreadsheets saved in XLS and XLSX files. Simply type in a keyword or phrase in the Search box, select which folder PowerGREP should go through and which types of files are of interest. When you click the search button, PowerGREP will present you with a list of Excel spreadsheets and other files in which the text you entered in the search box was found. The list will show one line of context for each match. You can instantly inspect the entire context by double-clicking on the match in the results. With PowerGREP's collect data feature, you can extract data from Excel spreadsheets and other files and automatically save the extracted data into one or more new text files. You can group identical matches together and count them, producing informative statistics. 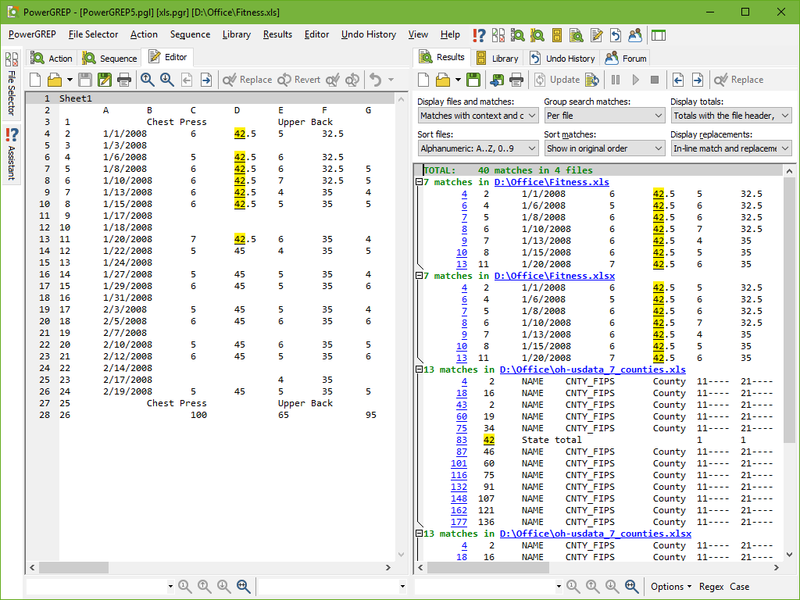 PowerGREP is capable of searching through Excel spreadsheets in both the XLS and XLSX formats without the help of Excel. You don't even need to have Excel or Office installed. To be able to quickly search through very large numbers of Excel files, PowerGREP opens the files directly, and extracts the text from the file. This is the same text that Excel displays. The extracted text is what PowerGREP searches through. If your cells contain formula's, the formula's result as it is displayed in the cell is searched through. The formula itself is ignored. When inspecting search matches inside PowerGREP, the built-in file editor shows the plain text version that PowerGREP actually searched through. You can always use the Edit button's drop-down menu to open the file in Microsoft Excel. PowerGREP is not able to modify XLS and XLSX files when searching through their plain text conversions. You cannot search-and-replace through XLS files using PowerGREP. You can search-and-replace through XLSX files if you search through the raw XML inside them. Starting with Office 2007, Microsoft Excel uses a new file format called Microsoft Open XML. These files have an .xlsx extension. XLSX files are completely different from XLS files. Whereas XLS files are opaque binary files, XLSX files are technically ZIP archives that contain a bunch of XML files along with support files such as images. In the File Formats section in the Preferences, PowerGREP provides an option to search through the raw XML content of XLSX files. If you are familiar with XML, this opens up a whole world of possibilities. The XML tags represent your document's formatting. By searching for, removing and inserting the XML tags, you can search for and alter the formatting of your document. To find out which tags to use, simply create a few test spreadsheets in Excel using the formatting you want. Navigate inside the XLSX files in PowerGREP's File Selector. Right-click on one of the xl\worksheets\sheetN.xml files, and select Edit. PowerGREP's editor will show you the raw XML code that PowerGREP searches through.